Theatre KAPOW explores the truths of human experience through the passion and electricity of live theatre performed to the highest standards of excellence. tKAPOW produces the best dramatic works from across ages and cultures to inspire and challenge both artists and audience. 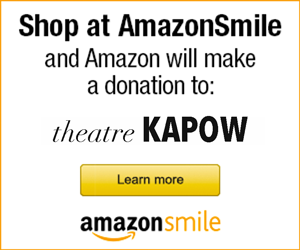 tKAPOW places a tremendous amount of emphasis on the process of developing works of theater. A purposefully designed and focused work development period is key to ensuring the highest quality of theatrical product. Joining the ensemble of a tKAPOW production requires commitment to a 6-week work development period that will include collaborative discussions about production design, concept, and source material; physical and vocal training sessions; involvement in a peer support and feedback system; exploration of character and analysis of text; discovery and expression of relationships; generation of movement sequences and an understanding of stage picture; and other practices. It is expected that all members of the ensemble will work on their own time outside of scheduled ensemble meetings to get off book quickly, to experiment with emotional and psychological exploration and physical expression, and to arrive at ensemble meetings with a personal plan for work and play. 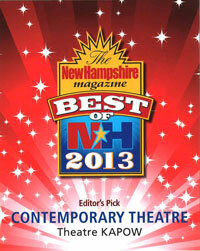 The editors of New Hampshire Magazine picked theatre KAPOW as the best contemorary theatre in New Hampshire for 2013.